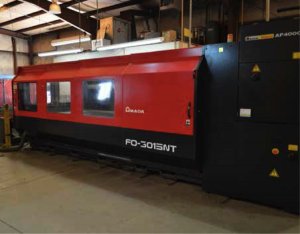 2005 AMADA FO3015NT, 4000 WATT FLYING OPTICS LASER CUTTING SSYTEM, WITH SHUTTLE PALLEY SYSTEM, 5FT X 10FT SHEET SIZE CAPACITY, S/N 37510995. 2004 AMADA HFE 50-20S, 6FT X 50 TON CNC HYD PRESS BRAKE, 7 AXIS CONTORL, S/N V040157. 2000 AMADA HFE-130-3S, 1FT X 130 TON HYD CNC PRESS BRAKE, MULTI AXIS. WYSONG MTH-100-96, 8FT X 100 TON CNC HYDRAULIC PRESS BRAKE WITH AUTOBEND 7 BACK GAGE, S/N MT15-113. 2000 AMADA APELIO 367V III, CNC LASER PUNCH MACHINE WITH 2000 WATT LASER, 33 TON PUNCH SYSTEM, 58 STATION TURRET, AUTO INDEX, WITH AMADA MST1530 LOADING SYSTEM, S/N 33670050. NAKAMURA SC-300 CNC LATHE WITH LIVE TOOL TURRET, SUB SPINDLE, CHIP CONVEYOR, FANUC 18It CONTROL, LNS BAR FEEDER. HYD MECK S20A FULLY AUTOMATIC HORIZONTAL BAND SAW. HYD MECK S20A FULLY AUTO HORIZONTAL BAND SAW. SOCO CNC TUBE BENDER, MODEL SB-65X2B-1S. DAEWOO MODEL 3016L CNC VMC, 40 TAPER, 24 ATC, 8000 RPM, 30 X 16 X 20 (XYZ). NAKAMURA TOME 18 CNC LATHE, WITH FANUC CONTROL, 10 POSITON TURRET, 8’’ CHUCK. DAEWOO PUMA 2000SY, CNC TURNING CENTER, LIVE TOOL, SUB SPINDLE, 8’’ CHUCK, FANUC 18I CONTROL. MATSUURA 550-VG CNC VMC, 40 TAPER, 21 X 16 X 18 (XYZ). 2015 IR R45I-A125, 60 HP ROTARY AIR COMPRESSOR WITH DRYER. PARTIAL VIEW OF MILLER WELDERS. SCOTCHMAN 120 TON IRON WORKER. LARGE SELECTION OF RACKING, PACKAGING MATERIAL. SHOP TOOLS, DIES, FORMING TOOLS, JIGS, TOOLING AND ETC. SURFACE GRINDERS, DRILL PRESSES, BURR KING SANDERS, AND SUPPORT.